In her newest hilarious endeavour, Olivia embarks upon a quest for identity and individuality. It seems there are far too many pink and sparkly princesses around these days and Olivia has had quite enough! She needs to stand out. 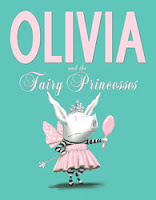 And so, in typical 'Olivia' style, she sets about creating a whole array of fantastically dressed princesses… and shows us that everyone can be individual and special. Olivia has always been an individual…that’s why we love her! 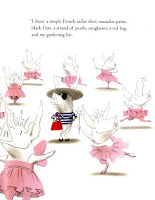 In this book Olivia starts to question her identity and her individuality. She just doesn’t understand why they all was to dress up like pink princesses. 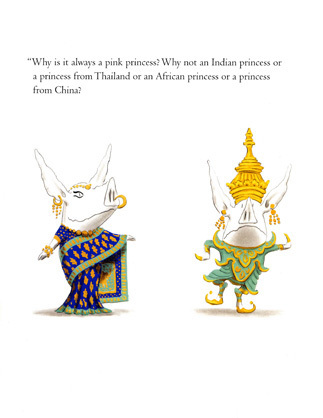 If you want to be a princess why not a princess form India, Thailand, Africa or China? When all of the others in her class came to school dressed as Princesses for Halloween, Olivia was a warthog. At Pippa’s birthday party everyone dressed in pink, ruffles with sparkles and crowns…Olivia chose “…a simple French Sailor shirt, matador trousers, black flats, a strand of pearls, sunglasses, a red bag and my gardening hat.’ It’s not that she has anything against princesses, but if everyone wants to be a princess, then they aren’t special anymore. Olivia just doesn’t understand why everyone wants to be the same! I think the reason I love Olivia so much is because she appeals to adults as much as she does to children. The younger readers probably don’t see it, but most of us will know a little girl somewhere who has more than a little bit of Olivia about her! The other thing that amazes me is what I found out about the author, Ian Falconer. It just so happens that Ian Falconer is also an extremely talented set designer he has designed sets and costumes for the New York City Ballet, the San Francisco Opera, and the Royal Opera House (Covent Garden), among others. Some people get a sprinkle of talent from the Talent Fairy, and some people get a whole bucket load! As Olivia tries on identities, she considers: "Or maybe adopt orphans from all over the world!" The image: diapered babies, multi-ethnic, with sad mouths and blank stares, with Olivia smiling proudly as she surveys her brood. 1) the message implies adoption as philanthropy, and if the intent is to poke fun at high profile international adoptions, that is a message with NO PLACE in a children's book. 4) the bottom line - how could the author, publisher and all the people involved in creating this book think, for one minute, that it is appropriate for ANY child to receive these messages, let alone adopted children, from a CHILDREN'S BOOK! This book has astonished and angered me to no end. I honestly want to burn it.